It’s not been very long since I have entered the Telecom space; but I am extremely impressed to see the incredible work done by Vodafone in M2M. From last 2 weeks, I am going through some extensive training on this technology & I am blown away to see how M2M is revolutionizing industries from various verticals these days. Few street lights in India are not manually managed; they are street lights which are operated based on the Sun & Moonlight. To enter your hotel room all that you need to do is tap your Smartphone. Car Insurance premium can now be calculated based on your driving habits. Not only today people are getting smarter, it’s the machines which are getting smarter than us. Thanks to M2M technology. This technology has been around for quite some time now, but these days we see its implementation very often. Machine to Machine communication is considered to be a highly developing domain, which will work as an enabler for making various verticals “Smart” by providing the capability of transmitting data in real time by using wired / wireless networks, this communication concept offers will provide a wide range of opportunities that will help enabling novel business cases, enhanced workflow, efficiency and improved quality of life. Network Services Layer: Provided by the Network Service Provider (Telecom Service Providers). 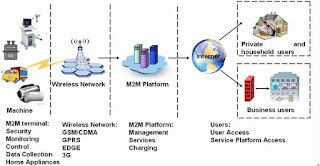 M2M Services Layer: Based on Internet Protocol (IP) and provided by the M2M Service Provider. 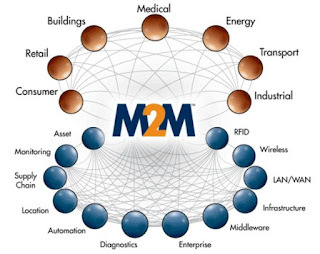 M2M refers to the technologies that allow wired / wireless system to communicate with the devices of the same ability. 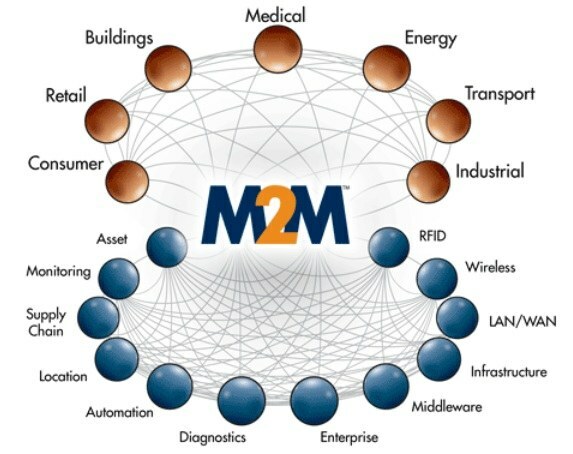 M2M solution connects machines or devices to the internet transforming them into intelligent devices that can exchange real time information. 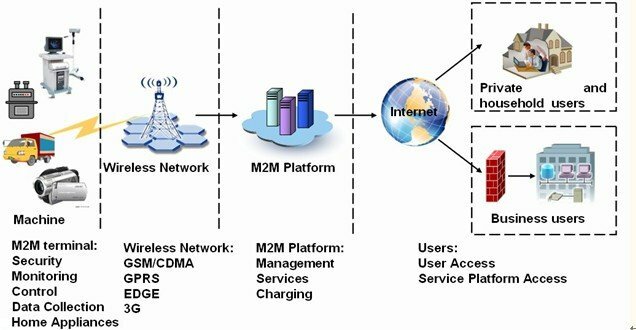 M2M uses a device (sensor, meter, etc.) to capture an 'event' (motion, meter reading, temperature, etc. ), which is relayed through a network (wireless, wired or hybrid) to an application (software program), that translates the captured event into meaningful information. RFID, wireless sensor networks (WSNs), Location based services (LBS). Cellular 2G/ 3G / LTE MTC (3GPP rel 12), fixed line BB for WAN depending upon the applications. IPv6 capable of providing unique IP addresses to all the devices available on earth. Devices may be connected directly to the M2M platform or through Gateway / aggregator, depending upon the design of the network. Fixed M2M devices may be connected through gateways having connectivity on lease lines (IP) / fixed line BB or on SIM based connectivity. Smart metering, smart grid, Electric line monitoring, gas / oil / water pipeline monitoring. Point of sale (POS), ATM, Kiosk, Vending machines, digital signage and handheld terminals. Highway, bridge, traffic management, homeland security, police, fire and emergency services.